Our neighbour Pierre-Louis came round yesterday to hear for himself what it’s like living near a motorway. That’s what it’s felt like since they started lifting the garlic a couple of weeks ago. Pierre-Louis is a young farmer who took over the family farm a few years ago. With a wife and young daughter to support, he is naturally looking to expand his operation. He recently took advantage of an offer from a private power company that he couldn’t refuse. 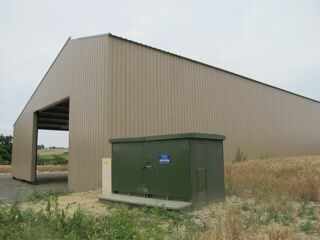 The deal is that the company will build you a “state of the art” barn [you organise and pay for the interior] and in return they get to install solar [photovoltaic] panels on the roof and for 30 years they reap the profit from selling the electricity and the farmer gets the use of the barn. 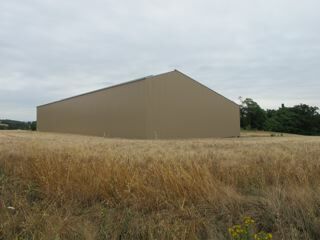 After 30 years, the barn and the roof panels become the property of the farmer. A good deal and as a result, barns have been springing up like morning mushrooms all round us! 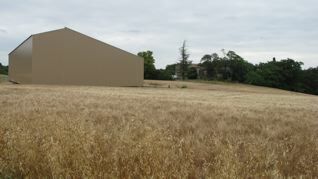 Fortunately for us, the two nearest of these new barns, Pierre-Louis’ included, are tucked in behind conveniently-placed thickets of oak–so we don’t see them. Ears-sore though–enough to drive you crazy–te rendre fou–like the mistral in Provence. Pierre-Louis has increased his profitable garlic crop, producing much more than his father used to. He needs more barn space and the use of large electical drying machines to dry it. His garlic tresses no longer hang prettily in the ancient barn, drying gently in the breeze, but are blasted by the drier–twenty four hours a day, for four to six weeks after the harvest–hence the noise. Our house is at the end of a noise tunnel–getting the full benefit of this round the clock cacophanous concert. Pierre-Louis’s been busy with the garlic harvest and now the hay–setting up an effective sound buffer for our benefit has not been a priority perhaps–but he’s a reasonable man. He came over to hear for himself the heavy hum of the “autoroute”. On hearing the sound he saw the light and agreed it is too much. We’ve negotiated some quiet times–and the promise of an ESB [effective sound buffer!]. He never mentioned it, but it is his living after all. Sounds as though you are acting kindly and reasonably, which is not often the case in neighborly conflicts!